Every fall, Apple unveils its newest products, with the iPhone usually overshadowing every other updated device. This year the next generation Apple Watch Series 4 stole the show with its new features, the most notable being the built-in heart-tracking feature. The new watch carries with it a larger display, coming in two sizes of 40 mm and 44 mm for a larger viewing experience. The display itself is 30 percent larger than the previous models and comes equipped with a brand new modular watch face that better displays the information needed for all of the new additions. For color, buyers options are silver, gold and space gray. The Apple Watch has continually been upgraded since its original release in 2012, but this year it is taking a giant step into the medical field. The heart tracking feature is an electrocardiogram, or ECG, and the device has been cleared by the Food and Drug Administration. The FDA cleared it as a Class II medical device, which has incited controversy over how dependable the device truly is. A Class II medical device undergoes much more regulation and is considered a life-saving device. Some examples are powered wheelchairs, condoms and pregnancy tests. The ECG worries me, as cardiologists have said that the watch could alert the user of small heart issues, like when your heart rate appears to be low or if there is an irregular rhythm detected, sending them to the hospital when there is actually no real problem. I would rather not have to worry about my watch going off all the time, causing me to think I need to go to a hospital, only to end up wasting my time waiting for hours. Plus, this would lead to a lot of testing that would probably yield results that posed no threats to my wellbeing. If insurance covers these visits, then it would not be a problem but there has been no information released yet. I am not completely against the idea of the ECG, since numerous physicians have said that it could help people be aware of real problems that the typical person would not normally notice. In this instance, I think it would be valuable to have in case there actually is an issue that needs attention. However, if this is true, then how would I ever know about these things if I didn’t have the watch? Doctors should already be able to tell me if there is something irregular with my heart beat. The watch also comes at a hefty price, starting at $400. I cannot imagine spending that much money on a device that I wear on my arm and that I don’t need, even if it does calm my nerves about my health. I know this is not the only new feature, but it has been the most talked about since they announced the Apple Watch Series 4. Having a heart monitor also worries me about the future of technology. These devices are only going to get stronger and at some point society could possibly only rely on technology to tell them when something is wrong, instead of actually being aware yourself. There is also an improved built-in breathing app that helps guide you through deep breaths simply by raising your wrist. Seems like overkill. Also, Apple has never been in the medical field, even though previous renditions of the watch have had heart-tracking features, those only focused on monitoring exercise and fitness, not life-threatening issues. I like the idea that the company is branching out, but the medical field is so vast and requires in-depth research that Apple could become overwhelmed. The smarter option would be to invest into education and work with schools, which would increase the presence of the products and show that Apple cares about the youth. No matter what I think, it looks like Apple is only going to move forward with the idea of tracking medical conditions with their products. This is going to be a big leap for the company, and if it works, the prices will continue to rise. 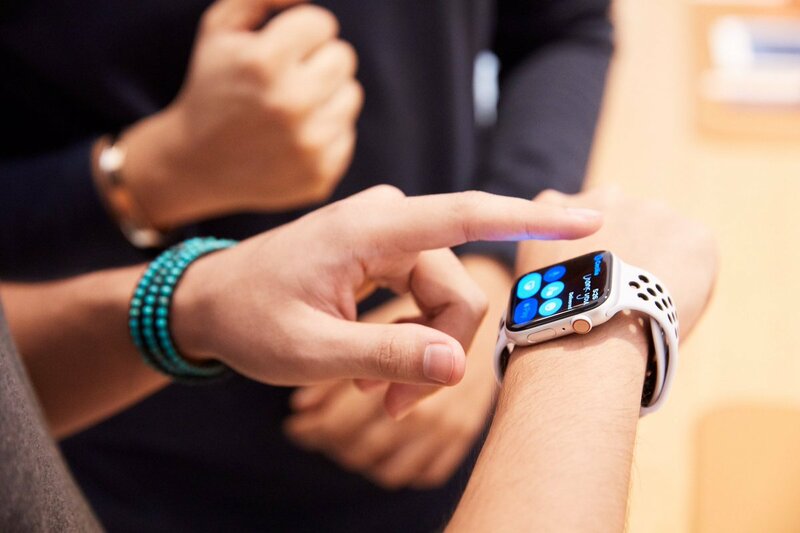 Once customers start using the new Apple Watch and visits to the doctor’s office rise, there will be more information on the reliability of the product. Until then, the only thing left to do is speculate.